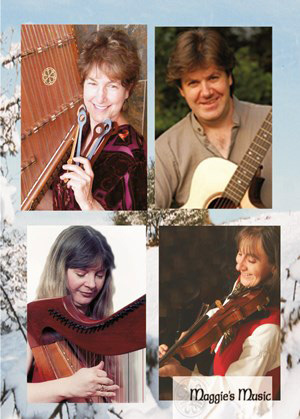 A multi cultural mix includes Maggie Sansone on hammered dulcimer, Andrea Hoag on fiddle and from Scotland Sharon Knowles on Celtic harp and from Ireland Patrick Egan on guitar and vocals. Heartfelt and uplifting. A perfect holiday recording suitable for all ages. "Maggie’s Music has been at the heart of a musical movement that explores Celtic roots and American soul in a great variety of authentic acoustic delights." "Whether Renaissance dance tunes and hymns of Celtic laments, lullabies and carols, the music crackles with energy and glides with grace." When there was an attempt in the new colony to abolish the first acts of religious toleration in the New World by a group of Puritans also burned Catholic churches in Maryland, the great influx of Anglicans helped to mediate between faiths, and tolerance was reinstated. The Anglicans also loved Christmas: from the time St. Anne’s Parish was established in 1692, there are many stories of the true Colonial Christmas spirit. In the early 18th century Maryland Reverend George Herbert, wanted one and all to be sure "that the church be swept, and kept clean without dust, or cobwebs, and at great festivals strewed, and stuck with boughs, and perfumed with incense." Christ Church, on the West River, dates from 1867. It’s built in the “Carpenter Gothic” style that A.J. Davis advocated in the era, and is the happy home of Maggie’s latest Christmas celebration. It’s appropriate we have an Irish singer in Pat Egan: the bragging rights for the first Irish to succeed in the New World belong to this little state. The scion of the huge clan whose mark is across the founding of the nation, Charles Carroll, was an Irish Catholic. A well-educated student of law, he came to Maryland from Ireland in 1688 to serve Lord Baltimore as Attorney General. Our Scottish performer, Sharon Knowles will also be most at home on these shores. From Ninian Beall’s Maryland settlement of Scots in the early 1670s, to the subsequent Jacobites who were captured and sold as servants (or, in the case of so many, escaped to a Catholic-tolerant land after the defeat of Bonny Prince Charlie), this has been a home to people who celebrated Christmas with a Celtic temperament. Maggie’s Italian heritage is here as well. After the first craftsmen came in the early 1630s, Catholic Maryland was deemed a haven for Italian refugees; a formal declaration of the Lords Proprietaries of Maryland in 1649 encouraged Italians to migrate to the colony. And, in deference to our wonderful fiddler Andrea Hoag, the settlements that made up New Sweden extended into Maryland for decades. Liner notes by Robert Aubry Davis of public radio and television and Sirius/XM Satellite Radio. He is creator and host of the early music program Millennium of Music. All tunes traditional except Tr. 9, Christ Church Cathedral by John Sheahan; Tr. 10, Planting in Winter Andrea Hoag, Wildflower Seed Music (BMI) Publisher: Wonders Crossroads Music (BMI)/Maggie’s Music Administration. Artists Photos: Maggie Sansone by Viki Garte, Andrea Hoag by Tom Radcliffe, Sharon Knowles by Dan McDermott, Patrick Egan by Sean McComisky. Recording Engineer: Gary Bowden (www.alchemyaudio.net) recorded the music live in 2012 and 2013 at the historic Christ Church, West River, Maryland (USA). .
Christ Church , West River (www.christchurchwestriver.org), Connie McKenna, Richard Crenshaw and the staff at Maggie’s Music; Patrick Egan thanks Tony Small for the song I Wonder As I Wonder.